Russian Helicopters presents new Mi-171A2 Medium Multirole helicopter at MAKS 2013. Russian Helicopters, a subsidiary of Oboronprom, part of State Corporation Rostec and a leading global designer and manufacturer of helicopters, will present the new medium multirole Mi-171A2 at the MAKS 2013 International Aviation & Space Salon, which starts on August 27 in the Moscow Region town of Zhukovsky. The helicopter has already arrived at the Gromov Flight Research Institute aerodrome where it will be based before going on static display as part of Russian Helicopters' exhibition at MAKS. The Mi-171A2 is one of the most eagerly anticipated new models of the Russian aviation industry. 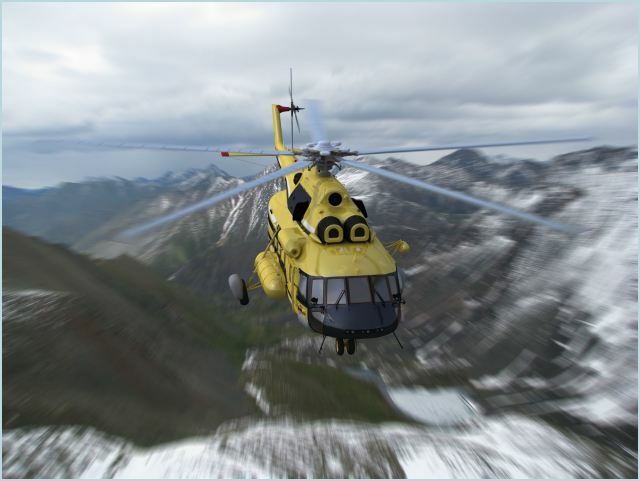 It has been created using the latest technologies, and builds on the many years of operating experience of the Mi-8/17 series of helicopters in different climatic conditions around the world. Thanks to a number of innovations the Mi-171A2 boasts substantially improved flight capabilities and technical parameters, as well as expanded functionality. The helicopter is fitted with a powerful and economical VK-2500PS-03 engine, modified transmission and rotor system that prolong the helicopter's operating life, and composite main rotors and a new X-shaped tail rotor. The cabin can be quickly and easily reconfigured as a transport or passenger helicopter, and additional equipment can also be fitted as necessary. The helicopter's designers have achieved a high level of safety and reduced cost per flight hour. There is expected to be particular interest in the helicopter's KBO-17 integrated glass-cockpit piloting and navigation system, which makes the helicopter more responsive and significantly reduces crew workload. The avionics suite includes a PKV-171A digital autopilot. The producer of the integrated on-board systems, Concern Radioelectronic Technologies, will display at its pavilion a working prototype of an Mi-171A2 flight simulator for pilot training. The medium multirole Mi-8/17 series is the world's most popular helicopter, with more machines produced than any other in its class, and today is widely operated around the world. There is expected to be a high level of interest from helicopter operators in the new Mi-171A2, which combines the finest qualities of the Mi-8/17 series with the latest developments and technologies. At MAKS 2013, Russian Helicopters plans to make a number of presentations of the prototype of the new helicopter to partners and potential Russian and foreign buyers. The Mi-171A2 programme has already been introduced as a marketing presentation in all key markets. The Mi-171A2 is a core project for Russian Helicopters. It is planned that all subsequent commercial and military versions of the Mi-8/17 family will be based on the innovations already in use in the Mi-171A2. By the end of 2013, Ulan-Ude Aviation Plant plans to send a second prototype of the Mi-171A2 to Mil Moscow Helicopter Plant for improvements and testing. Russian Helicopters plans to complete certification of the Mi-171A2 to the flightworthiness standards of the Aviation Register of the Interstate Aviation Committee in 2014, with deliveries to buyers scheduled to start in 2015.